Earlier this morning, as I perused the perpetual misery engine that is Twitter, I saw a message from a man wanting book recommendations, specifically from authors. Tell me, he asked, five reasons why I should read your book. Obviously, my immediate reaction was to mourn for the poor man’s mentions, lost to the void of endlessly self-promoting authors desperate for a slather of free promotion. Then, of course, my author brain kicked in, and I screamed at my screen that I HAVE A NEW BOOK ON SALE. It's a rip-roaring apocalyptic adventure of murder and stale sandwiches. The world ends, but not in a way you've seen before. There's a serial killer on the loose, which is bad timing for all involved. The characters are pretty damn cool, and some of them can be quite funny when they’re not fleeing for their lives. My mum said it's really good. By now I imagine you’re saying to yourself that that’s all well and good, but what do other people think? Well, how about the bestselling author of 99 Red Balloons, Elisabeth Carpenter, who said the following: "I loved the Blood on the Motorway series! Set largely in the north of England, we follow a wonderful cast of characters as they try to survive an apocalyptic event that destroys most of the population. It has everything you could want in an end-of-the-world story. Perfect for fans of 28 Days Later, Shaun of the Dead, and ITV's Survivors." 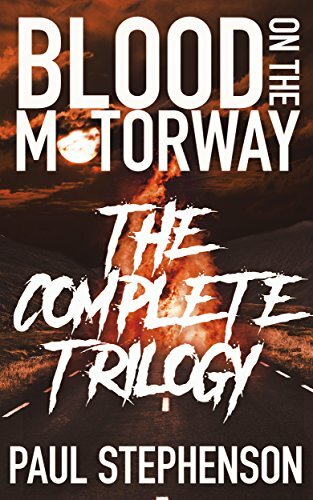 Now, for the first time, the full Blood on the Motorway trilogy is now available as a single box set on Amazon and all the other bookstores, and for the staggeringly low price of £6.99/$8.99. That’s cheaper than buying the first two books and getting the third for free! Not only are you getting three excellent books, but you’re getting them for roughly the same price as a bottle of wine. As for the guy who wrote the original tweet, well, he deleted that pretty quickly. Either that or the universe took pity on him and deleted it for him before his twitter folded in on itself.